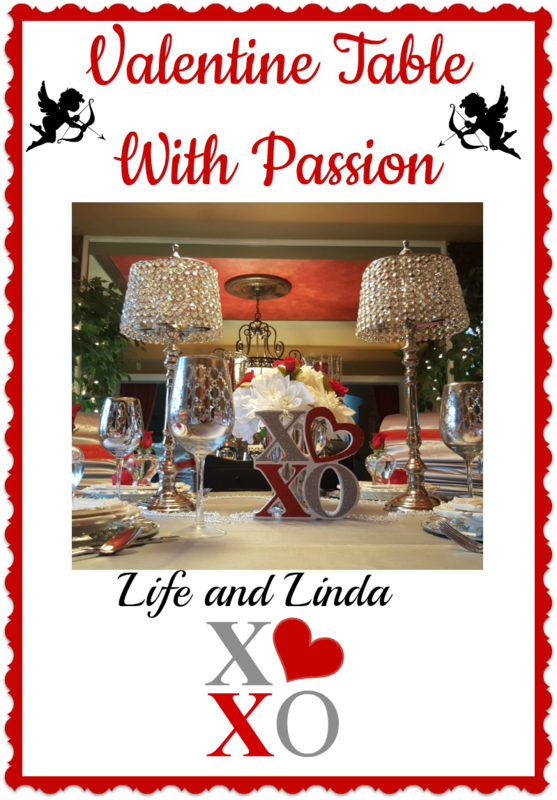 Home / passion / silver / tablescape / valentines / Valentine Table With Passion! Are you ready for Valentine's Day? Have you planned anything special? Dinner out....a movie.....dinner in with a special home cooked meal. It is a special day, however I think everyday should be filled with love. 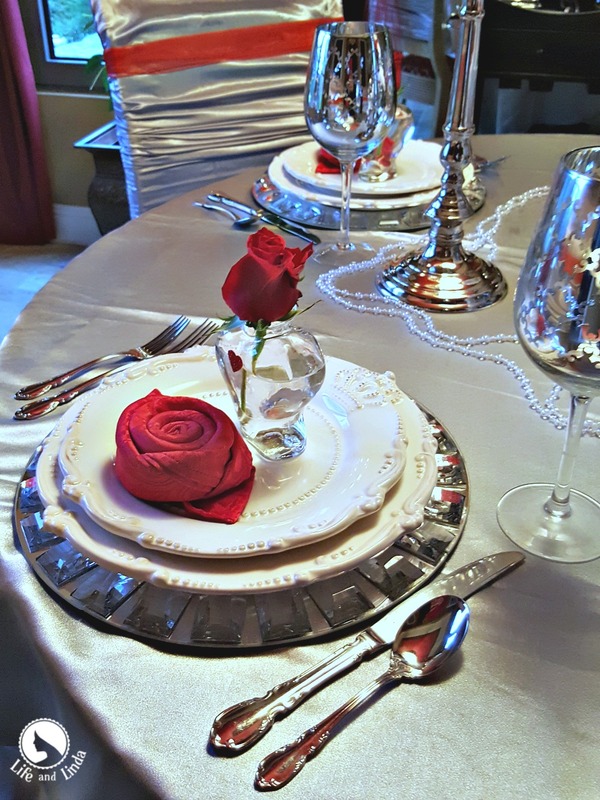 I set this table with the blingy plate chargers with mirror. I am using our crown plates. 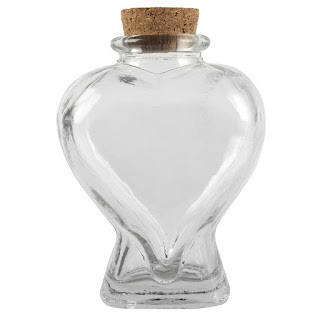 The cute little heart bottles were found at Michaels. I simply added a single red rose. Love symbols...Kisses and Hugs. I found this cute item at Safeway. I couldn't find a price, so I took it up front to self check out and asked the cashier about the price. He called the floral department. There was no codes and only 1 left, so they sold it to me for $2.24. What a deal! 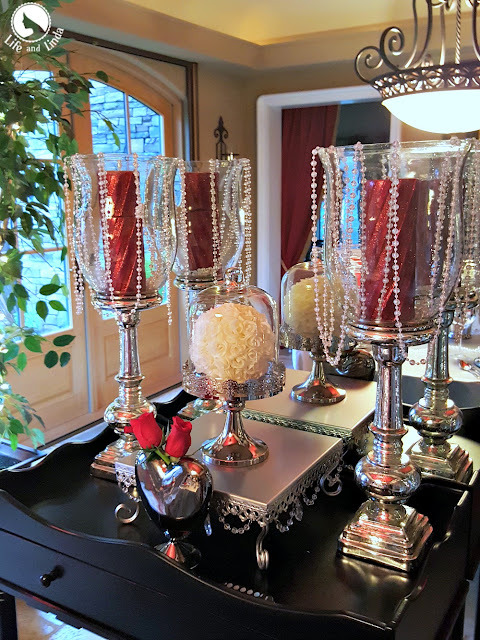 I love using our bling candle holders. So much elegance! The pearls are another lovely addition . The black dessert always comes in handy for serving or adding accessories. Tall silver candle holders sit on each side of the silver cake stand. I added those pearl strands and red candles to make a bigger impact. The silver dessert cloche is also from Safeway. I am up to my old tricks again, using silver pillow cases on our chairs. I added a red chair sash to complement the red accents on this table. After all, it is a passion table. So many of you asked about the rose napkin, so I thought I would share the video I learned it from. You can find me at these parties. Pretty table, Linda. Every element is lovely but I especially love your glasses and the rose and the rose vase is beautiful. So fresh and beautiful. I've been impressed with your napkin rose folding. Thank you for sharing the video where you learned how to do it. I think I can do it now. So pretty and romantic! Love the silver tablecloth and the bling candle holders! I might have to try the pillow case trick sometime! I watched the video for the rose napkin- how fun and easier than I imagined! Thanks for sharing! Loving the heart bud vases. What a great deal on the XO piece! 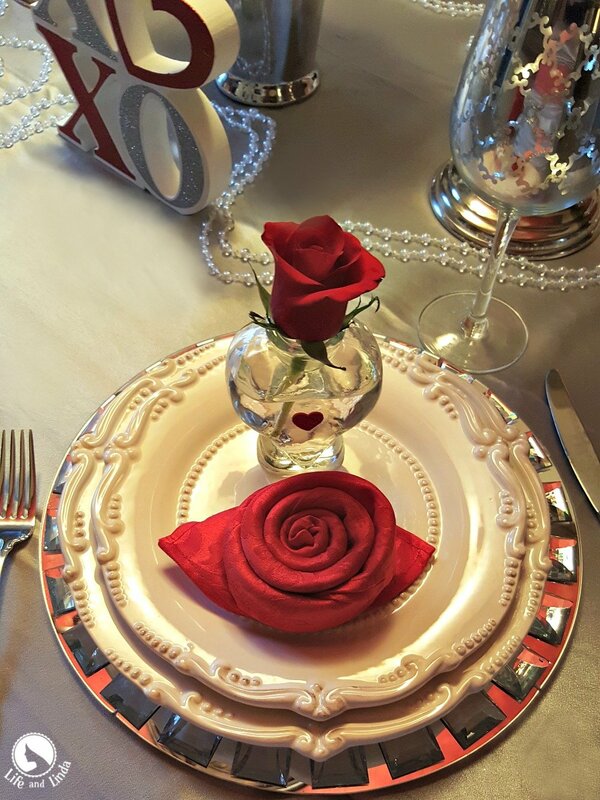 Love your rose napkins, so pretty paired with the sweet heart rose mini vases! 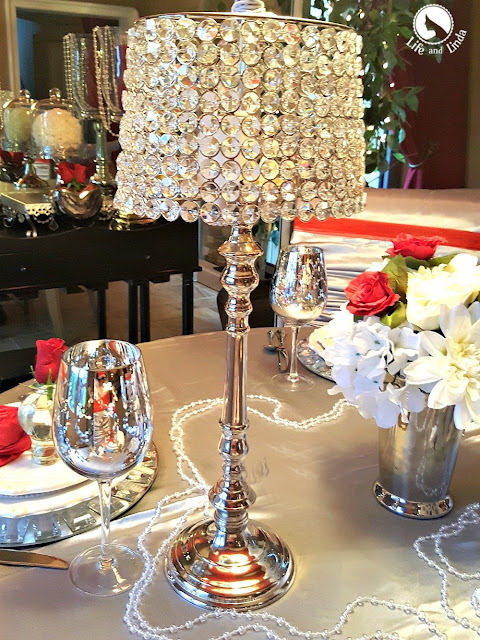 Just the right amount of bling for a Valentine's table to be extra special. I like the flower arrangement of white with just a touch of red…it really pops that way. Thank you for sharing the video for the rose napkin. I love the bling, Linda! 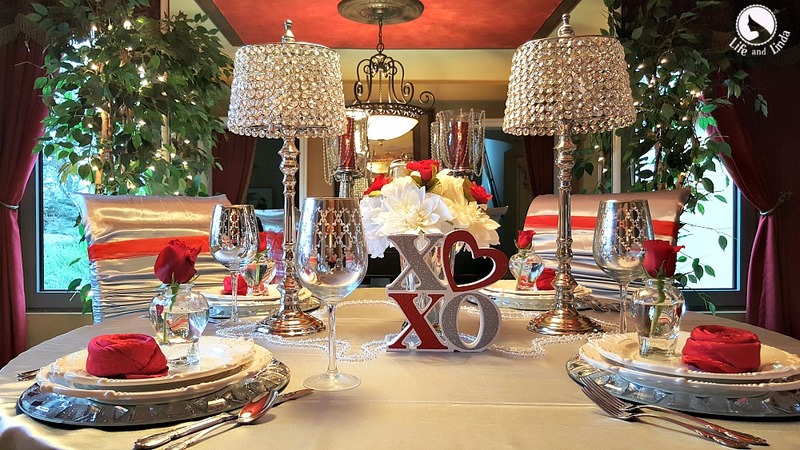 It is such a romantic tablesetting for Valentine's Day. We always stay home and avoid all the crowded restaurants. I try to make every day special with my sweetheart! 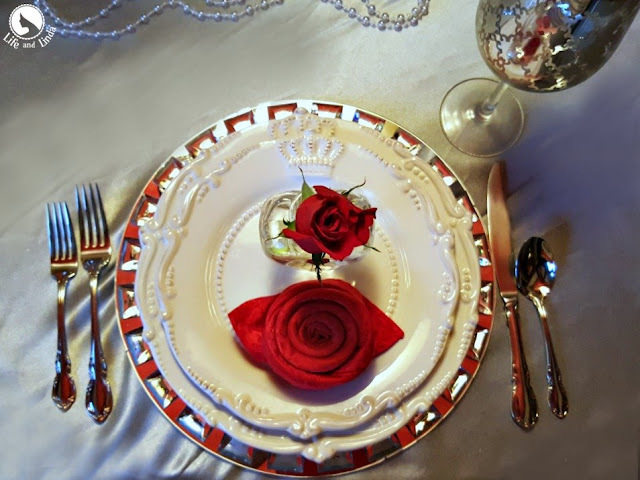 Your table setting looks spectacular, Linda, and thanks for sharing the video on the napkins! 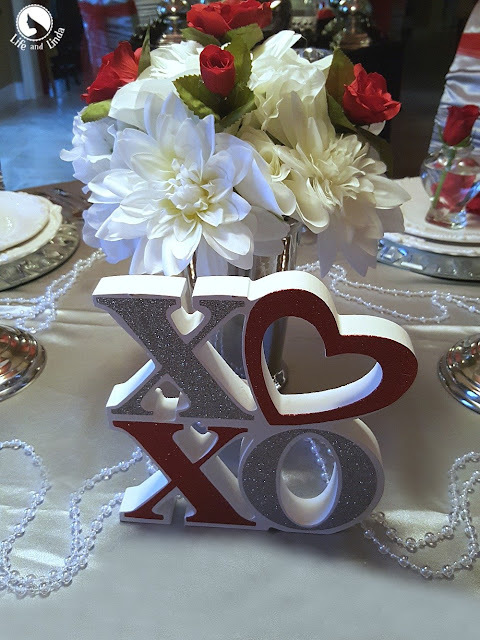 I love the hugs and kisses centerpiece! I'm avoiding many Valentine's Day things, as this would have been our 30th wedding anniversary but I HAD to stop by to tell you how beautiful your tablescape looks. Gorgeous & I love all the bling! Cherish each other & make the most of these special days. Beautiful table, Linda. I hope you and your sweetheart have a fun, romantic evening. A very glamorous table, Linda, and romantic as well. Hope you have a fun evening. Hi Linda, Just beautiful. This is such a elegant and lovely table setting. Anyone would feel love sitting here for dinner. Love the napkin roses too and thank you for sharing the video. Your table setting is perfectly designed for a romantic dinner. I always enjoy seeing your talent and how you bring different elements together, just beautiful! Beautiful designed table Linda. Just so perfect for Valentines. So many beautiful things! I love all of your glitter (of course) and your tall candlesticks dripping with beads. We had friends over for a movie and chocolate cake after we all went out. It was a lot of fun and simple.